Most technology and web related work requires sitting at your desk all day long and clicking at the computer. Before repetitive stress injuries get the better of you, add some simple exercises and stretching to your workday. 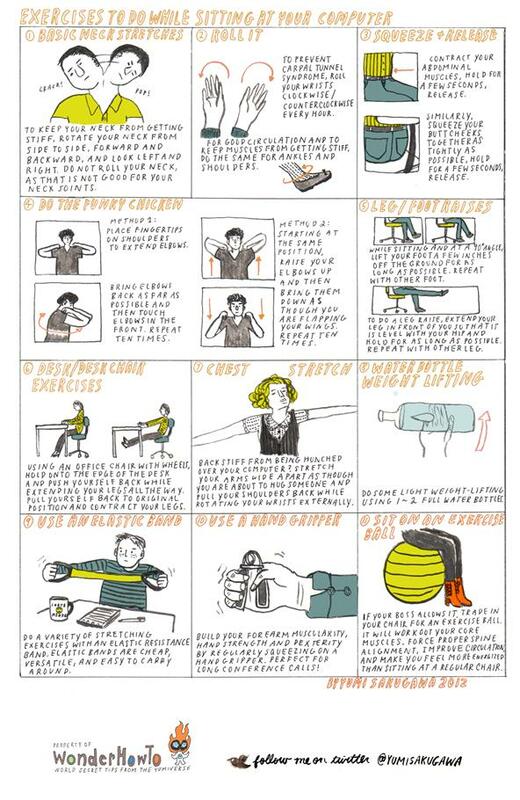 I keep this info-comic illustration by Yumi Sakugawa on my desktop to remind me to stretch through out the day. She provides simple body, neck and wrist stretches to keep your body from getting stiff. The “Water Bottle weightlifting” looks a bit like the Shake Weight, which I would pay to watch anyone do in the cubicle at their office!